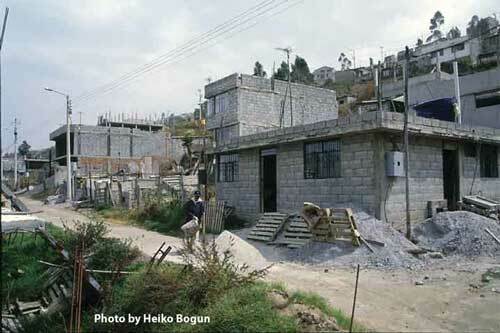 Ecuador’s government initiated a nationwide program called the Housing Incentive System – Sistema de Incentivos para la Vivienda (SIV) in 1998 which ran until 2005. This program consisted of two components, one oriented towards the construction of new housing and another for the improvement of existing self-built houses. The latter component is considered as it was aimed at low-income groups. The Ministry for Urban Development and Housing - Ministerio de Desarrollo Urbano y Vivienda (MIDUVI) rewarded savings by means of a single premium awarded to families in need of assistance. Within the new housing component, a voucher known as the 'Bono para Vivienda Urbana Nueva' financed up to 75% of the value of the new construction, with a maximum subsidy of US$1,800. These vouchers were aimed only at middle-income families. Barrio Calderon, Ecuador The SIV program for housing improvement was based on a market-led approach; low-income families could receive technical and financial support in order to improve their self-built houses and apartments with roof repairs or the addition of a new room to a house. The premium 'Bono para Mejoramiento de Vivienda Urbana' is worth up to US$750 (US$850 in historic city centres). The difference between this amount and the estimated building costs could be made up by a mortgage loan arranged with a financial institution working within the system, at the usual local interest rate. The SIV program also became known as the ABC program, standing for 'Ahorro' (savings), 'Bono' (subsidy) and 'Crédito' (loan). Generally, the system was organized in such a way as to create market incentives for the private sector. A distinctive characteristic of both components of this program was that the voucher was a targeted, single payment made directly to individuals. In a previous housing promotion program, the government provided subsidies that reduced the interest rates on loans for building, but this scheme did not prove successful; the number of loans was low and the requirements of the poor were not met. The private construction sector was responsible for the implementation of the program. 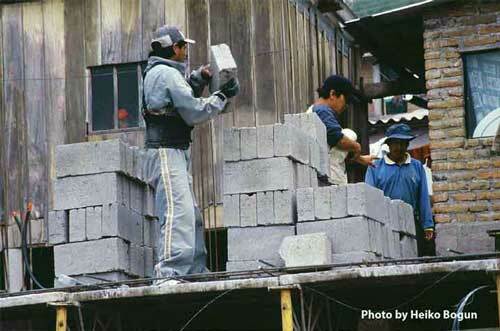 Small technical construction firms known as 'technical units' (Entidades Técnicas – ETs) worked within the SIV housing improvement scheme on a market basis. Any private firm in the country could be accepted as an ET within the system, once certain conditions were fulfilled. In 2002, approximately 180 Ministry accredited ETs existed in the country. These ETs drew up an individual contract with each customer and earned a percentage of the construction costs. It was their responsibility to help families with housing needs to obtain the building subsidy, i.e. to fill in applications and check that the necessary requirements were fulfilled. They also provided advice on the type of building project that should be undertaken, carried out the planning, and supervised the technical implementation of the construction. The ETs therefore assumed a greater responsibility in this system than is usual for planning and construction firms. Because of their multi-faceted tasks, the ETs employed not only technical staff, such as architects and engineers, but also social workers, who were responsible for contact with the customers. Generally, each ET consisted of a group of four to twelve people. They were usually located in or near low-income neighbourhoods and could therefore easily generate contact with the people involved and establish a good relationship with them. Barrio Calderon, Ecuador Between the beginning of the program in 1998 and October 2002, approximately 25,000 vouchers were awarded and paid out to 25,000 low-income families for housing improvement. ( Confirmed data exist only until 2002.) The same amount was paid out for new houses, assisting 25,000 middle-income families. The state has thus provided approximately 50,000 vouchers in total, and a sum of around US$69 million was invested. It should be noted that the vouchers were not distributed equally throughout the country; the provinces of Pichincha and Guayas, home to the two most populated cities in the country, received approximately 50 per cent of the total number. The average total sum invested in housing improvement was US$1,230 per family and house. Of this amount the family provided US$480 (US$100 savings plus US$200 additional savings plus US$180 incidental costs) and the government subsidy provided US$750. That is, the family contributed approximately 40% and the state approximately 60%. If the minimum investment of the family (US$140) is considered, then the family contributed only about 19%. A key aspect is that the program worked with housing improvement and so intervened in consolidated areas. Existing networks were neither encouraged nor destroyed and officially the poor could be reached. Each applicant was responsible for the procedure, taking on the lending risk when a loan was obtained, and for the building process. The existence of infrastructure in existing settlements was not regarded as a problem and rising construction and land costs in existing settlements did not influence the program deeply. Paid employees of the ET were responsible for the construction, the quality of which was regarded as good and beneficiaries were satisfied. Beneficiaries were in direct contact with the private construction sector and therefore were accepted as clients and could propose the intended improvement to be carried out. Their self-built house was improved and perhaps this gave them a higher level of satisfaction.